IRVINE, California, August 26, 2005 - Roland DGA Corporation, a leading provider of wide-format inkjet printers and integrated printer/cutters for the sign making, POP, exhibit, labels and vehicle graphics markets, today announced new and improved ECO-SOL MAX ink. ECO-SOL MAX achieves new levels of performance and represents a major step forward for ink technology. In addition to the company’s award-winning line of inkjet printers and integrated printer/cutters, Roland has pioneered the development of advanced inks that meet the highest standards for performance, safety and durability, including the first pigment ink for wide-format inkjets. In 2003, Roland broke new ground with the introduction of Eco-SOL INK, the industry’s first eco-solvent ink and a safe, cost-effective alternative to hard solvent inks. ECO-SOL MAX builds on this advanced ink technology with several enhancements including faster drying time, higher density, wider color gamut, improved scratch resistance, and expanded uncoated media support. In addition, ECO-SOL MAX is virtually odorless, contains no harmful VOCs, and requires no special ventilation or environmental equipment. 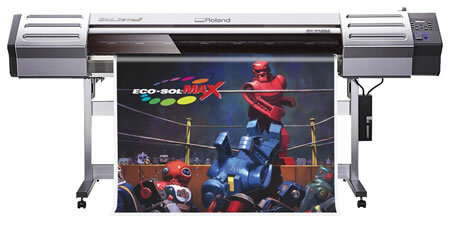 Featuring an improved drying time, ECO-SOL MAX produces graphics that are dry to the touch after printing. This advantage increases productivity and allows ECO-SOL MAX ink to perform with take-up roller systems for long, unattended production runs, even in high-speed mode. For even greater durability, ECO-SOL MAX features improved scratch resistance, critical to the production of outdoor banners and other graphics that involve complex finishing techniques. For outdoor banners, ECO-SOL MAX maintains image quality throughout the printing and finishing processes including welding, sewing, and the attachment of grommets. With higher ink density and wider color gamut, ECO-SOL MAX graphics reflect superb color when viewed at a distance or close up. ECO-SOL MAX is available immediately from Roland and is compatible with all PRO II V SOLJET™ and VersaCAMM® printers and integrated printer/cutters. Reflecting the company’s commitment to providing complete solutions, Roland offers a comprehensive line of tested and certified inks and media. Widely recognized for their performance and durability, Roland inks include the company’s new ECO-SOL MAX ink featured in all VersaCAMM and PRO II V SOLJET inkjets; Roland aqueous ink, available in both dye and pigment options for Hi-Fi JET™ printers; and custom HeatWave® sublimation ink, an option for VersaCAMM integrated printer/cutters and the SOLJET SJ-1045 grand format printer. Roland specialty inks include the industry’s first white eco-solvent ink, available as an option for the SOLJET SC-545EX. The Roland media lineup includes more than 50 products that have been strategically selected to meet the needs of the company’s diverse customer base in the sign, vehicle graphics, fine art and photography industries. All Roland media products are profiled for performance with the company’s inkjet technologies including VersaCAMM, SOLJET and Hi-Fi JET printers and integrated printer/cutters. Roland DGA is ISO 9001:2000 certified, and Roland DG is ISO-9001:2000 and 14001 certified. Roland’s Color Products Division markets the company’s advanced inkjet technologies in North and South America (except Brazil) through its Authorized Resellers. Major products include the SOLJET, VersaCAMM and Hi-Fi JET Pro lines of inkjet printers and printer/cutters. Roland’s newly-formed Advanced Solutions Division is responsible for marketing the company’s complete line of vinyl cutters, engravers, 3D scanning and milling devices, and a photo impact printer. For more information, please call (800) 542-2307 or visit the Web site at http://www.rolanddga.com.